Thanks to the graph, yours truly doesn’t need to bore readers with lots of numbers. Outside of very small blips, there is virtually no point on the above graph where the trajectory of job growth under Obama is as high as that seen under Reagan, even though the Reagan-era workforce was about one-third smaller. If done on percentage of workforce, the slope of the Reagan-era ascent would be even steeper. For those who crave some numbers — In its first 37 post-recession months, the economy under Reagan added more than 9.8 million nonfarm payroll (NFP) jobs, over 7 million more than the 2.7 million added under Obama. To replicate the Reagan-era performance, the economy under Obama would have needed to add over 14 million jobs since the recession’s end; it has really added less than 20% of that. 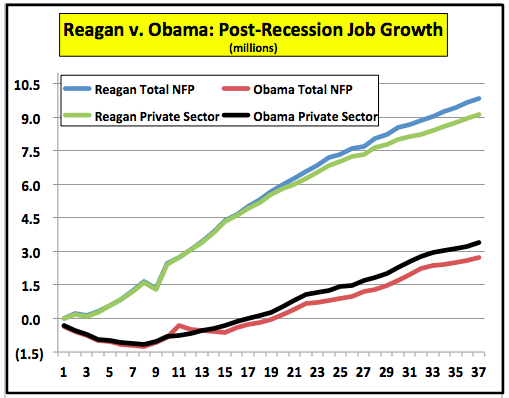 The Reagan-era private sector margin is over 5.7 million jobs. What’s more, after 29 months of allegedly stellar job growth under Obama, the jobless rate is still 8.3%. By this point in the Reagan and Bush jobs recoveries, the unemployment rate was 7.2% and 4.9%, respectively. If we were one of those fact-checking organizations, we’d give Stephanie Cutter the “Lying Liar from Liersburg” award. A Google News search done this morning on “Stephanie Cutter Reagan” (past week, not in quotes, sorted by date with duplicates) returned six items (the final result listed pre-dates Cutter’s lie). The results are from American Thinker, Real Clear Politics (2), National Review, Washington Examiner, and United Liberty. The same search at the Associated Press’s main site returned nothing. AP’s “Presidential Campaign Fact Check” appears to be limited to what the presidential and vice-presidential candidates say. The wire service is currently carrying its interview with President Obama, naturally headlined “AP INTERVIEW: OBAMA CALLS ROMNEY’S IDEAS ‘EXTREME’,” on its “Top Story” page. Zheesh. Except that 2.7 jobs from the trough are not full time positions, ALL of them are PART TIME positions. So says the BLS. So it is no wonder that household income has dropped. Here are the stats starting with 1/1/07 to current so we can clearly see the apex of total employment and the nadir in Feb 2010 of 126,091,000 to the current (July) figure of 131,619,000. Doing the math. 5,528,000 total jobs have reappeared from the trough to current figures. Jan 2007 – 4,620,000 Feb 2010 – 9,108,000 = 4,488,000 where it has essentially hovered at these unprecedented levels. The Non-Economic reasons are more difficult to calculate given the cyclical nature where the troughs typically fall in the summer. Feb 2007 – 20,236,000 versus May 2012 topping out at 19,319,000, a loss of 917,000 part time jobs. I blame ObamaCare as the reason for this mass conversion of full time to part time jobs in order to position against the onerous regulations. The Sept. 7 report will be really interesting (and I’m afraid depressing) in this regard.